For those who enjoy mid-century modern furniture, the Wander Dining Chair from Zuo Modern offers a perfect choice to brighten up your dining room or kitchen. This deluxe dining chair includes stunning upholstery in brilliant blue aqua, providing the piece with a dazzling appearance. It also features poly-silk/velvet construction along the inside and a rounded inside back to create a modern sculpted cup-style that is all its own. Pick up an eye-catching chair that is both sleek and practical with the Wander Dining Chair. Boasts a mid-century modern design that transforms the chair into a contemporary classic. 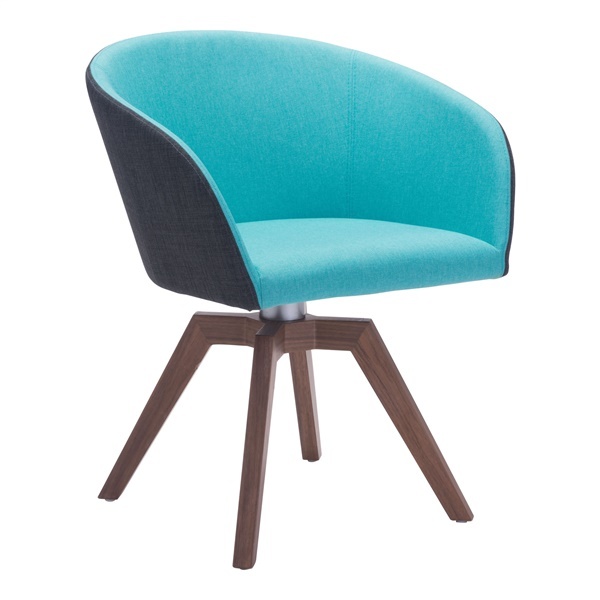 Includes stunning upholstery in brilliant blue aqua, providing a dazzling appearance. Features a poly-silk/velvet feel along the inside and a rounded inside back to create a modern sculpted cup-style that is all its own. Supported and finished by a strong, sturdy cross-style all wood base in a luxurious warm walnut tone.